Official white mug with album cover of "Anthems to the Welkin at Dusk". Official white mug with album cover of "In the Nightside Eclipse". Official white mug with band photo inside a pentagram. 4th album from '14 of this spanish band of true old school Black Metal in the vein of the early works of MAYHEM, EMPEROR & IMMORTAL. 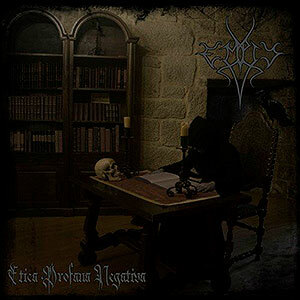 Vinyl version of the 4th album from '14 of this spanish band of true old school Black Metal in the vein of the early works of MAYHEM, EMPEROR & IMMORTAL. 6th album from '09 by this german band of fast Black Metal in its purest form. Split EP with one song from each of these two spanish Black Metal bands.